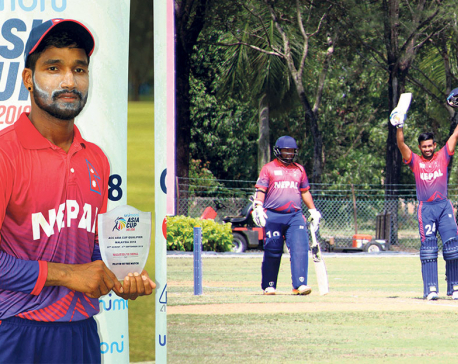 KATHMANDU, April 13: Pawan Sarraf produced a player of the match performance in ongoing ICC Asia Under-19s World Cup Qualifier to elevate Nepal U-19 national cricket team to a huge win by 217 runs against Singapore U-19 in match played at Selangor Turf Club in Kuala Lumpur, Malaysia on Friday. 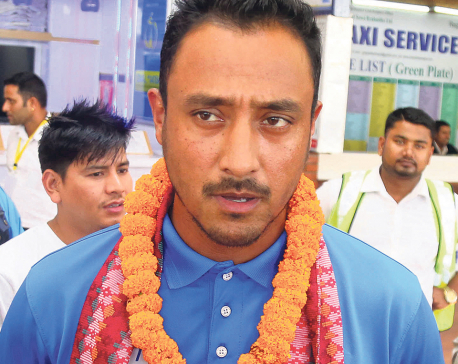 Skipper Rohit Kumar Paudel missed his century by five runs in Nepal’s total of 282 runs in a dominant all-round display from Nepal in the first match. 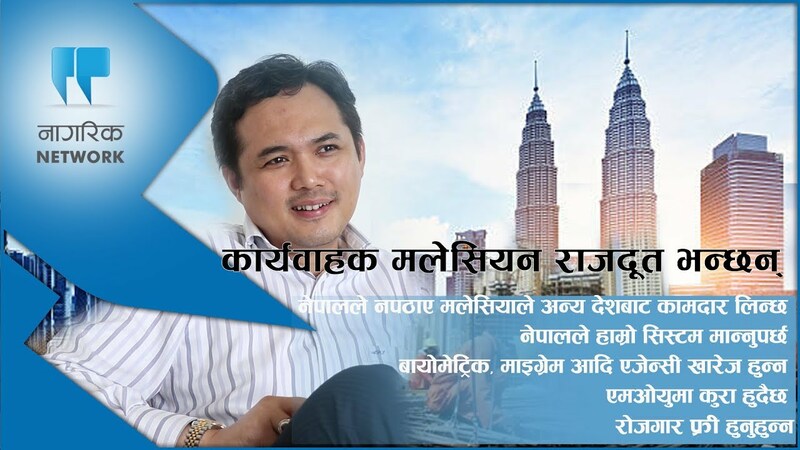 KATHMANDU, April 12: As many as 64 people have received a work permit from Labour Office Tahachal, Kathmandu within four days after the government opened work permit for Malaysia through call visa. KATHMANDU, April 8: Two Nepali migrant workers have died when a bus they were travelling in met with an accident in Malaysia. 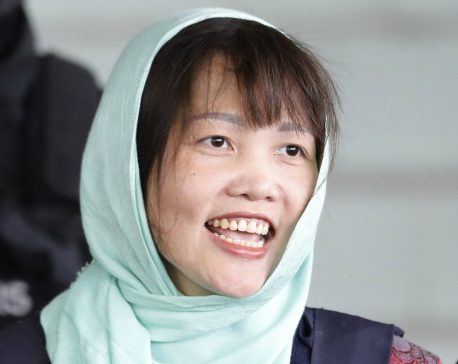 SHAH ALAM, April 1: A Vietnamese woman who is the only suspect in custody for the killing of the North Korean leader’s half brother pleaded guilty to a lesser charge in a Malaysian court on Monday, with her lawyer saying she could be freed as early as next month. KATHMANDU, April 21: Migrant workers, who were deprived of going to Malaysia since the last ten months despite getting their calling visa, can now go to Malaysia for job after the Ministry of Labor, Employment and Social Security instructed the concerned authorities to give them labor permit. 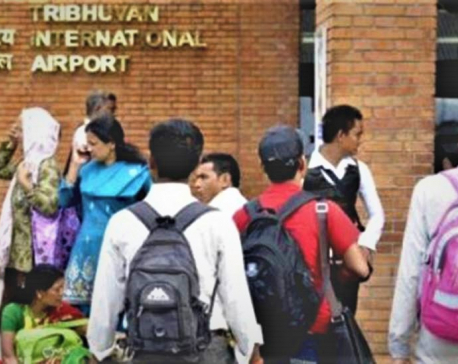 Kathmandu, March 23: Sixteen Nepalis stranded in Malaysia have been rescued and returned home by government authorities. They had been staying at the shelter homes after not being able to bear the return air ticket. 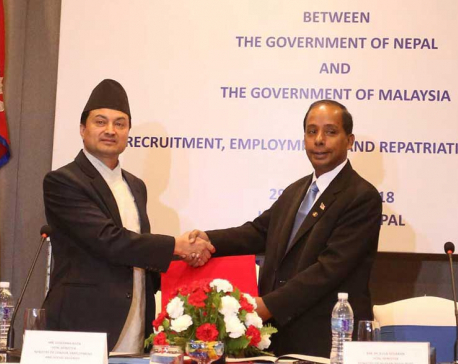 KATHMANDU, March 18: Nepal has pressed for earliest and effective implementation of the Memorandum of Understanding (MoU) reached with Malaysia in October last year for supply of Nepali workers to Malaysia. 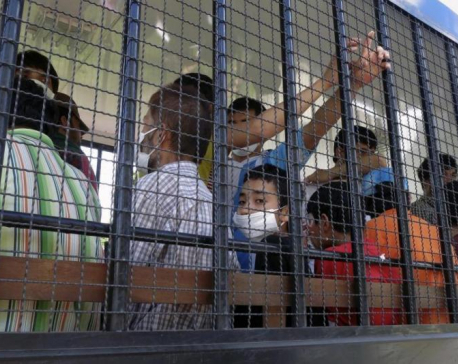 KATHMANDU, March 13: Kuala Lumpur-based Nepali Embassy rescued and repatriated 23 Nepali nationals, who were stranded in three separate detention centers in Malaysia. KATHMANDU, March 8: Nepal national football team is set to play two friendly matches against Kuwait and Malaysia in March. KATHMANDU, March 4: Malaysia is considering removing outsourcing agencies or agents involved in the hiring and management of foreign workers as the country prepares to streamline policies governing foreign workers. An estimated half a million Nepalis are currently employed in Malaysia. 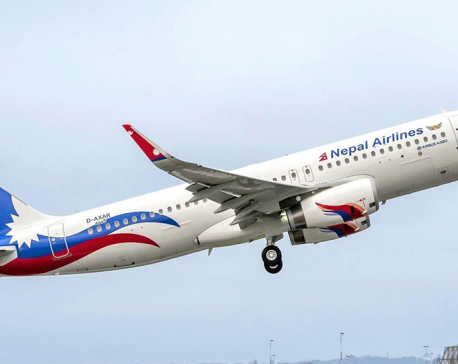 KUALA LUMPUR, Feb 19: While leaving for Nepal three months ago, Nar Thapa of Udayapur - a migrant worker - took a bus from his workplace in Malaysia to the Kuala Lumpur International Airport. 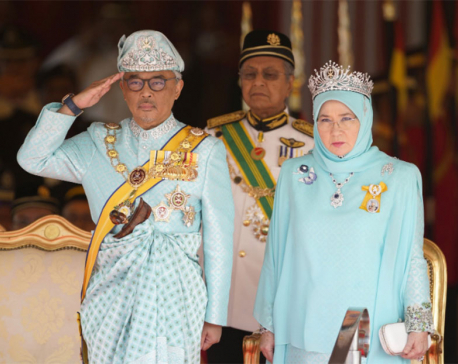 KUALA LUMPUR, Jan 31: Sultan Abdullah Sultan Ahmad Shah of central Pahang state has been crowned as Malaysia’s 16th king under a unique rotating monarchy system, nearly a month after the sudden abdication of Sultan Muhammad V.
KATHMANDU, Jan 14: A Boeing aircraft of Nepal Airlines Corporation (NAC) that was taken to Malaysia for repair around two months ago will be repatriated home tomorrow (Tuesday) after successful maintenance, said NAC officials. MALAYSIA, Dec 11: One Nepali migrant worker a day dies in Malaysia, according to statistics provided by the Embassy of Nepal in Malaysia. 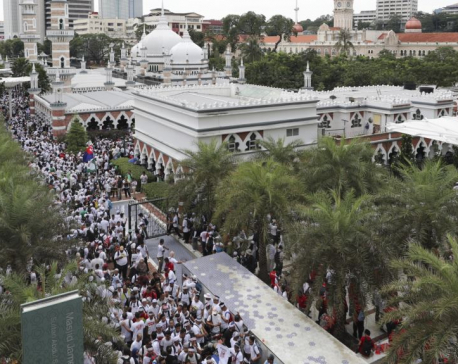 KUALA LUMPUR, Dec 9: Tens of thousands of Malaysian Muslims rallied Saturday in Kuala Lumpur against any attempt to strip the ethnic Malay majority of its privileges, in the first massive street gathering since Prime Minister Mahathir Mohamad’s alliance won a historic vote in May. 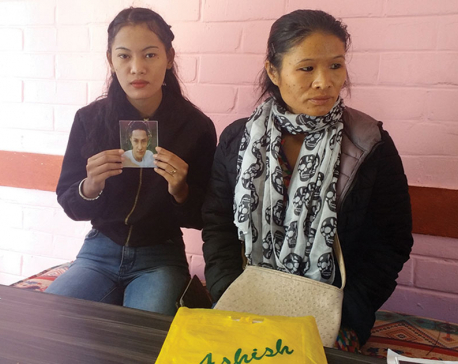 DHADING, Dec 3: Devaki Pandit of Siddhilek Rural Municipality hardly sleeps at night remembering her son who disappeared in Malaysia about a decade ago. Her son Damodar had gobe abroad promising her to bring home money and happiness. DARCHULA, Nov 16: Tara Singh Dhami, 35, of Malikarjun rural municipality-3 has died in Malaysia. Dhami was found dead near a hotel at 4 am on Thursday, Dhami’s family sources said. He had gone to Malaysia on foreign employment three years back. KATHMANDU, Nov 13: The new labor agreement between Nepal and Malaysia still falls short of meeting the standards set by the international labor laws, but many of its provisions could be used as a model for similar pacts that Nepal signs with other labor destinations in the future, say experts. 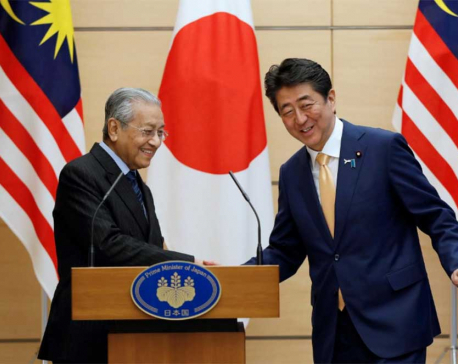 TOKYO, Nov 6: Japan is ready to extend Malaysia support to help overcome its financial problems if the need arises, Malaysian Prime Minister Mahathir Mohamad said on Tuesday. KHOTANG, Nov 6: Since a very young age, she wanted to study and have a successful career. To make this happen, she was required to have a lot of focus, dedication and hard work. 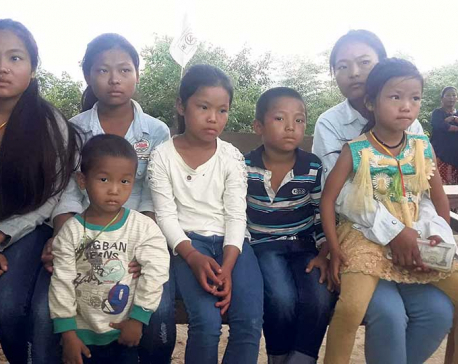 But at the mere age of 16, Suima Chamling has to invest all her efforts and focus to take care of six siblings – four younger sisters and two younger brothers. She is their sole guardian. NUWAKOT, Nov 4: Hari Bahadur Ghale of Barsunchet, Nuwakot, found himself needing more money to support his family. There was his two-year-old daughter to bring up and the cost of everything kept going up.So , like tens of thousands of other Nepali youths, he went to Malaysia in 2000 in hopes of finding well-paying work. He took a loan of Rs 200,000 to get there. 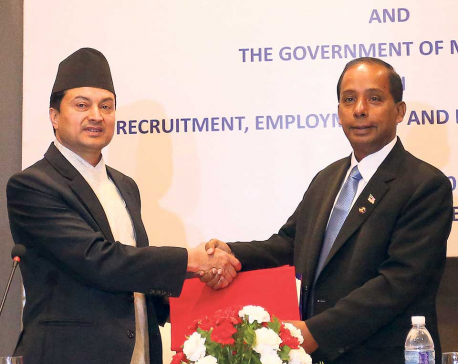 Nepal and Malaysia signed a memorandum of understanding (MoU) on Monday under which Nepali workers don’t have to pay a single rupee while going for jobs in Malaysia. KATHMANDU, Oct 30: The signing of the memorandum of understanding (MoU) between Nepal and Malaysia on Monday has paved the way for resumption of labor exports to Malaysia. KATHMANDU, Oct 30: Nepali workers going to Malaysia will not now have to pay a single rupee . Under a memorandum of understanding signed with Nepal on Monday, Malaysia has agreed to not place any financial burden on Nepalis bound for Malaysia for employment. KATHMANDU, Oct 29: Visiting Malaysian Minister for Human Resources M Kulasegaran has visited the Pashupatinath Temple this morning. KUALA LUMPUR, Oct 19: Malaysia’s former deputy prime minister has been charged with abuse of power, corruption and money laundering involving millions of dollars in another graft investigation against the leaders ousted in shock election results earlier this year. 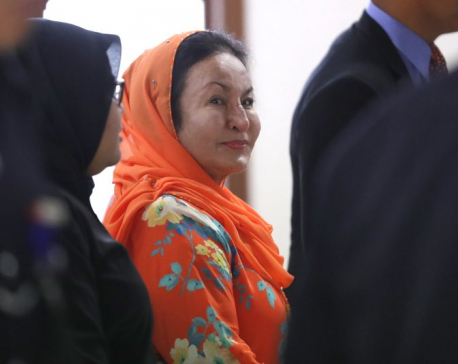 KUALA LUMPUR, Oct 4: The detained wife of former Malaysian Prime Minister Najjib Razak was brought to court Thursday to face money laundering charges in a graft scandal involving the 1MDB state investment fund. 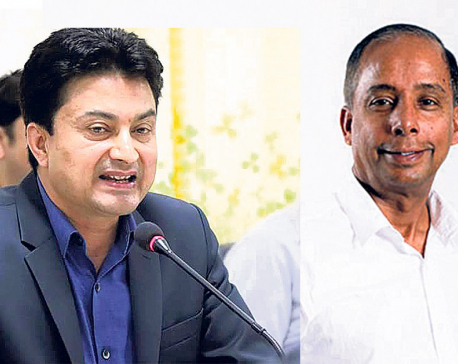 KATHMANDU, Sept 30: Prospective Nepali migrant workers to Malaysia might not have to bear hefty departure amount if a draft agreement between Nepal and Malaysia is to be inked. The draft agreement agrees that Malaysian employer will bear all the costs of going on employment to Malaysia, a popular destination of Nepali migrant workers. KATHMANDU, Sept 23: Nepal is scheduled to play its final match against Malaysia in the AFC U16 Women's Championship Qualifier at 3:30 pm today on the ground of the Armed Police Force at Halchowk, Kathmandu. 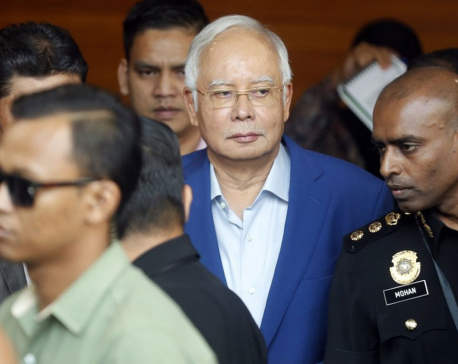 KUALA LUMPUR, Sept 20: Detained former Malaysian Prime Minister Najib Razak will face at least two dozen fresh charges of abuse of power and money laundering Thursday over the multimillion-dollar looting of a state investment fund, police and the anti-graft agency said. 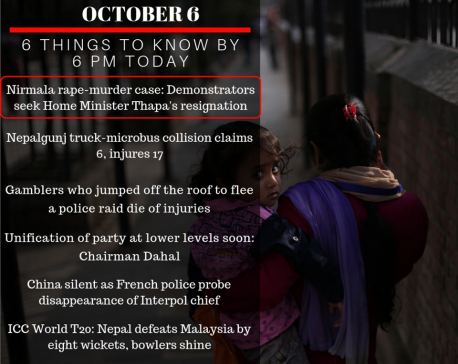 KATHMANDU, Sept 20: The number of Nepali deaths due to suspected alcohol poisoning in Malaysia climbed to six on Wednesday. KATHMANDU, Sept. 18: The death toll of Nepali migrant workers after the consumption of toxic liquor has reached six in Malaysia till this morning. 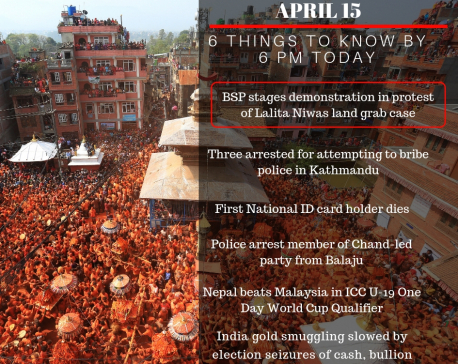 KATHMANDU, Sept 19: At least four Nepali nationals have died and several others taken ill in Malaysia due to suspected alcohol poisoning. 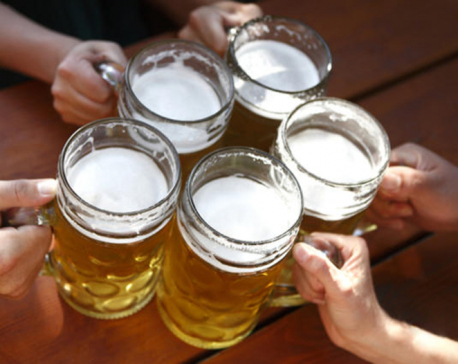 KUALA LUMPUR, Sept 18: 15 men, including mostly Nepali, have died due to the suspected alcohol poisoning in Malaysia. LANGKAWI, MALAYSIA, Sept 14: "Wow naturally Nepal, such a beauty of paradise and diversity." 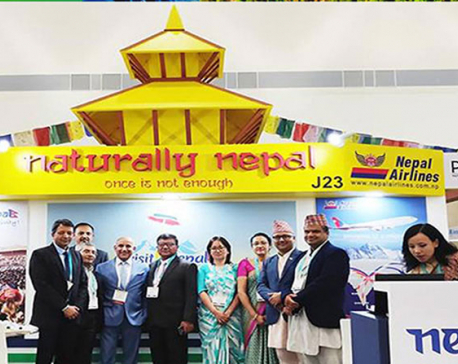 Kumar Subramaniam, a representative from the United Arab Emirates participating in the 41st edition of the Pacific Asia Travel Association (PATA) Travel Mart-2018, complimented a Nepali community home-stay service while inquiring about the service in the event. BAITADI, Sept 14: A Nepali migrant worker has died in a road accident in Malaysia. 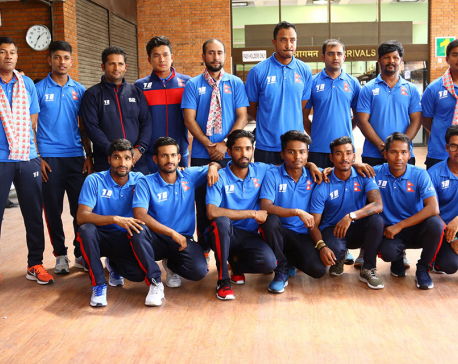 KATHMANDU, Sept 7: Nepali Cricket Team returned home today after participating in the Asia Cup Qualifier held in Malaysia. 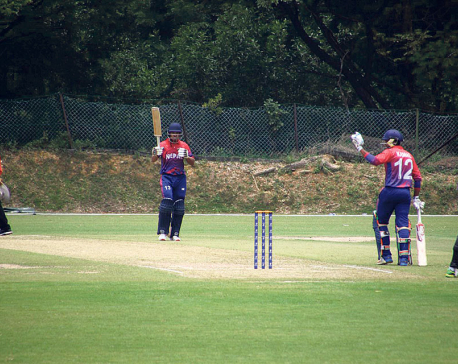 KATHMANDU, Sept 2: Nepal national cricket team registered their first win at the ongoing ACC (Asian Cricket Council) Asia Cup Qualifiers defeating Malaysia by 19 runs in Kuala Lumpur on Saturday. 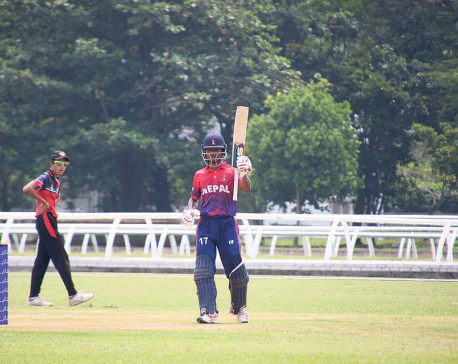 A heroic 101-run partnership between Dipendra Singh Airee and Aarif Sheikh helped Nepal post 188 runs on board in a rain-shortened match of 30 overs each side against the host nation. KATHMANDU, Aug 31: Malaysia could start hiring security guards from countries other than Nepal if Nepal continued to bar its citizens from taking up employment in the Southeast Asian country. If this happens, the move could potentially end a privilege enjoyed for long by Nepali citizens in Malaysia's private security sector.